© Goethe-Institut Kolkata/Photo Sharanya Chattopadhyay After working at the news magazine Marianne as journalist, then editor-in-chief and administrator of the website in 2006, he became an international volunteer at the French Embassy in India from 2008 to 2010, in charge of academic cooperation in West Bengal and the Northeastern States. At the same time, he pursued the activities of a journalist and a photographer for different entities, including aujourd’hui l’Inde and lecourant.info. 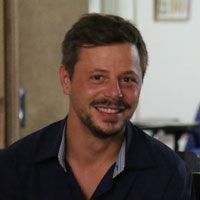 After the time at the International Relations Department of the University of La Réunion in 2011, he returned to Lyon to devote himself entirely as a freelance writer, photographer and filmmaker. He directed his first feature documentary in 2014: Tranquille sous le pont /Quiet under the Bridge. It is a self-produced film of 61 minutes, a social chronicle of three young Albanians seeking asylum in Lyon.